It’s a worthy effort—and, as a listener, how many times will you have the chance for real adventure inside a concert hall? “An Evening of Counterpoint.” Featuring Ran Blake, Alla Elana Cohen, and Darby The Red Persian Cat. At the Old South Church, Gordon Chapel, Boston, MA, June 5, 7:30 p.m. Counterpoint, contrast, contravention, conjunction, conversation, cooperation—all those “against” and “with” words will probably apply on June 5, when composer Alla Elana Cohen presents an evening of her works featuring solo piano interludes performed by master improviser Ran Blake. Modern musicians are far less concerned with category than are audiences, and this upcoming event is not designed as a throwdown match between “Classical” and “Jazz.” Instead, it’s a way for listeners to pull away from categories and hear each of the artists on her or his own terms. Cohen, a Russian-born composer currently on the faculty of both the New England Conservatory and Berklee, saw a natural affinity between Blake’s work and her own, and Blake was pleased to be part of the effort. The concert concept—to give each person’s music a framing provided by the other’s—is ambitious, and it offers both artistic promise and peril. It’s a worthy effort—and, as a listener, how many times will you have the chance for real adventure inside a concert hall? I have heard Cohen’s work only via her new CD, praise Him with harp and lyre, praise Him with strings and flutes (the idiosyncratic capitalization comes from the CD cover), so I am reluctant to generalize about it. It’s probably enough to say that her two decades in Boston have been marked by increasing attention and increasing praise. On the new CD, Cohen’s music is by turns austere and lush, reverent and brash, warm and cool. The harmonic language is uncompromisingly modern—you will listen in vain for conventional resolutions or minimalist consonance. Her work here has more in common with that of Soviet-era Russian composers—Shostakovich, Shchedrin, Gubaidulina—than it does with the music of Old Russia. Throughout the regime of the cultural commissars, musicians (and other artists) lived in uneasy tension between official acceptance and official condemnation, and the works that grew in this half-poisoned soil share a number of characteristics. What might have been gentle satire in a European composer’s work became bitter burlesque. Themes that might have been simple and romantic were tempered with distance and suspicion. In every innovation, there was a kind of over-the-shoulder glance to see who was watching and who might disapprove. It is music that constantly compared the aspirations of the human spirit and the disappointments that come from its oppression. Cohen is both part of this milieu and an escapee from it. Does this sound a bit like Ran Blake’s aesthetic? Irony and distance are tools that Ran has used in fashioning more than 50 years of music that is sui generis, interpretive music rooted in jazz that for the most part uses the work of other composers as a jumping-off point for his own pointed, editorial commentary, expressed in an approach to the piano that is so unusual that it lies outside any convenient categorization. However, in one significant way, Blake and Cohen are quite different. As an American, Blake is unafraid of full-throated melody—his embrace of gospel themes, soul music, film music, and the most heart-on-sleeve examples of American popular song provides a continuing source of light within the darkness he so loves. It seems to me that Cohen wants to hold back from this kind of directness, and I don’t think it’s going too far to see the program each artist has chosen for June 5 as an example of this contrast. “Writings on the Wall” is one of the most immediately communicative pieces on the new CD, and attendees at the concert will surely revel in all that percussion (timpani, vibraphone, marimba, orchestra bells) in a resonant space. The six short movements are performed without a break, and the dramatic impact of the suite is enhanced as a result. But any “Jewishness” here is decidedly internal. There are more connections to be explored, but the program will undoubtedly provide a lot more detail, and why should I take away your pleasure of reading about the music when you attend? To fill out this preview, I’d rather offer some personal guideposts—some things to listen for and some questions to ask yourself as you listen. Pay particular attention to Cohen’s writing for strings. Her use of fretboard snaps, pizzicato, glisses and other techniques shows how effective she is at her craft and how well she knows the instruments. It also seems that string players really enjoy her music, too. On the CD, the Licata-Wood-Krentzman-Baverstam quartet gives a very committed performance of “Sephardic Romancero,” and I wouldn’t be surprised if you see smiles on the performers’ faces when you hear it on June 5. You might pay attention to the “steps on a dark street” effect in the second movement of this piece and see if Ran Blake picks up on it when he plays. And as you listen to Blake, watch his feet as much as his hands; he achieves some remarkable effects by manipulating the piano pedals, and no other pianist in any genre is so effective at shading and coloring. Here are a few essay questions for you to ponder: How much will the juxtaposition of pieces illuminate and how much will it confuse? Will Ran Blake’s extreme use of dynamics require a lot of refocus as you move your ears from solo piano to chamber ensemble and back again? Will the rumble of outside traffic interfere with your enjoyment of Ran’s work? Will the set changes needed for each piece detract from the mood Ran establishes in his playing? Would you appreciate Cohen’s music more if the program were devoted to her work entirely, or is the use of interludes an inspired idea that you’d like to see used more often? Should Cohen direct the 14-piece chamber ensemble used in “Writings on the Wall” if she herself plays the piano part, as she does on the CD, or should she employ a conductor? And finally, will the cat steal the show? Oh yes, the cat. A red Persian named Darby is a bit player, scheduled to make an appearance as “the featured guest.” One can only hope he has good timing. 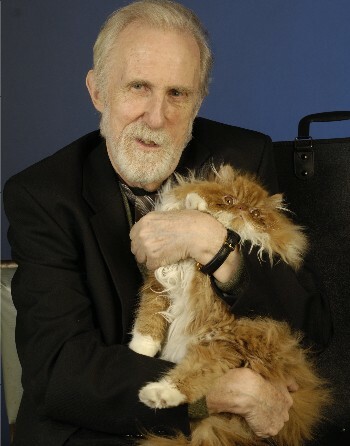 To provide some furry context, Cohen has programmed a piece for strings from her Hoffmanniana series, called “Johannes Kreisler – Cat Murr Quintet,” apparently inspired by E. T. A. Hoffman’s satirical novel translated into English as The Life and Opinions of Tomcat Murr. For his part, Blake will play “Cat Society,” his own reworking of Alex North’s themes from Val Lewton’s film Cat People. Alla Cohen, Ran Blake, and Darby, musical feline. Photo: Eric Antoniou. Who says serious music doesn’t have a sense of humor?